Tired of dealing with burnt grass spots from your dog? Read on for tips on how to prevent it! You love your dog, and love to play with him outside in your lush, green lawn. And then you start to notice brown spots all over the lawn. You can’t stop your dog from peeing outside where you taught him to go, so what do you do? Is there a way you can prevent grass burns from your dog’s urine? Below are some helpful hints to keep your lawn green and free from damage from your pet. The Culprit: There are 3 things that could be the cause of your dog’s urine to burn the grass. Nitrogen levels, the pH level or the concentration of the urine. So how do you know which it is? Really, the only way to figure it out is to do a urinalysis. Your vet can do this, you just need to bring a sample of urine to him. Nitrogen: Nitrogen is what is produced after the protein in his diet breaks down in digestion. It is excreted through urine. If the levels are high, it can burn grass. Quality foods for your dog can help to fix this problem. Normal levels of nitrogen should not burn grass, so if the levels are high could mean there is too much protein and it is not being broken down properly. A good quality food will allow your dog’s body to absorb more necessary nutrients, possibly resulting lower nitrogen levels. pH Level: Because dogs are carnivores, they tend to have a higher pH level. Other animals such as rabbits, have a lower pH level due to eating more vegetables and less meat. You can test your dog’s pH level by purchasing strips from your local drug store or online. It should not be higher than a 7 and not lower than a 6. A low pH level can bring up other health issues. Concentration: The more concentrated the urine, the more particles that are in the urine. That is what burns the grass. 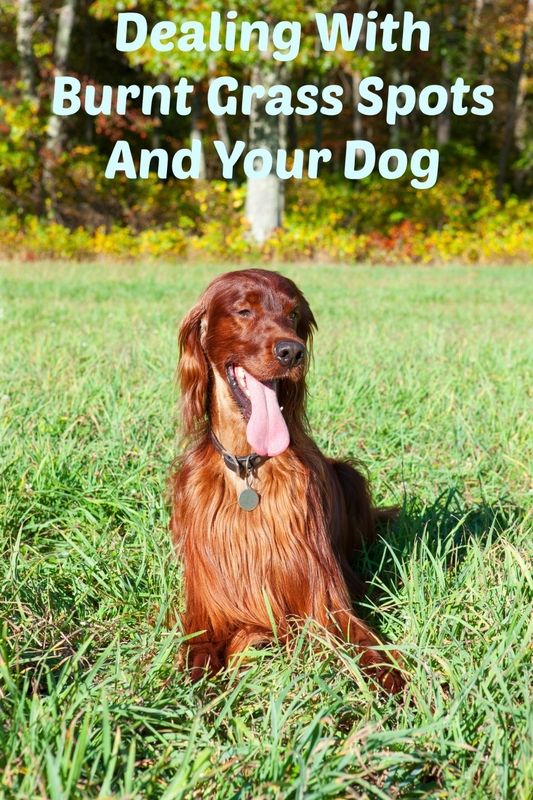 This can happen to both male and female dogs, however many people believe that grass burns come mainly from females because they tend to urinate in one spot all at once, where male dogs tend to mark their territory in different spots. Think of your own urine. The more yellow, the more concentrated. The water you drink, the more clear it gets. Dilute your dog’s urine by getting him to drink more water. As a general statement, when your dog is healthy, your grass is healthy! Granted, there could be other reasons for these burnt grass spots, but your dog is a good place to start. Have you ever had to deal with burnt grass spots on your lawn? What was your course of action? Share your experience with us below!